Dennis McCracken has always been interested in the political process. As an undergraduate at SIUE, he ran for Student Senate. "I failed miserably," he noted. He believes that his own vote was the only one he received among a large slate of candidates. McCracken earned a B.S. in 1973 in Political Science with accounting and economics minors; then, went on to earn an MBA in 1976. It appears as if Dennis has gotten a bit more adept at garnering votes since his days at SIUE. 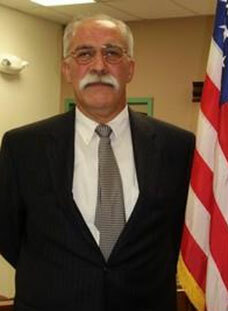 McCracken currently serves as the City Clerk and Collector for the city of Edwardsville, but he has had many careers. McCracken's worked for Rexall Drug Company, ITT Financial Corporation, Browning Ferris Industries, Sounddisk-Tributors Inc., and Mitch Murch's Maintenance Management. All these career paths have given McCracken diverse skills and professional experience. McCracken shared that big money and business were "front and center" at each company at which he as worked. He found the work to become less enjoyable as he witnessed this single-minded focus. In order to be happy at work, McCracken stresses "that you should find something that you enjoy doing." For that reason, he chose to make a career change. His duties as city clerk and collector involve "pure accounting, and directing five or six people in fulfillment of those accounting functions, as well as the legal functions," said McCracken. His job also requires McCracken to work closely with the Water and Public Works departments. Rich Hampton (BSA '90), who serves as the Financial Affairs Director for the SIUE Foundation and City Treasurer for Edwardsville since 2001, remembers when the former City Clerk left the position. "Dennis expressed interest and met with some of the City officials to discuss the opportunity," said Hampton. "Dennis came from private industry and has a broad range of financial management experience that we thought would be a perfect fit to administer the variety of responsibilities under the City Clerk's authority." Shortly thereafter, Mayor Gary Niebur appointed McCracken to the position of City Clerk and Collector. McCracken is responsible for the statutory duties of the City Clerk, as well as a majority of the financial applications for one of the largest cities in the area. "The City of Edwardsville is very fortunate to have Dennis serving its citizens in this critical role," said Hampton. McCracken enjoys the community that he calls "home" and spends time volunteering to make a difference. His volunteer experience dates back to his SIUE days, where he regularly volunteered as a member of Alpha Phi Omega. Southern Illinois University Edwardsville is authorized to operate as a postsecondary educational institution by the Illinois Board of Higher Education.